Tech books do not have the same entertainment factor as who-done-it mystery books. You’re not going to find out that HTML5 killed CSS3 with an AJAX on the desktop. The greatest HTML5 books are useful. They help designers and developers get things done. 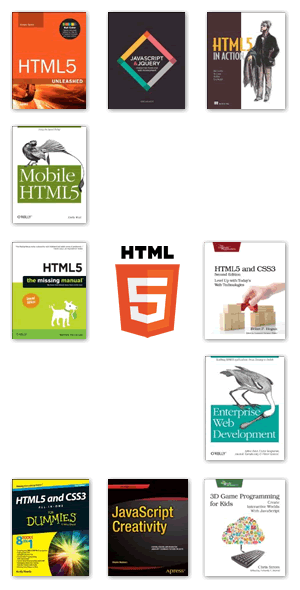 This list is comprised of HTML5 books that are going to be released in the second half of 2013 and also includes 2 books that will be hitting the shelves in 2014. They cover a wide range of skill levels. Beginners all the way up to your experts like Tim Berners-Lee may find a book worth reading. Six out of the ten books on the list are being released on the 22nd of their respective months…someone has been paying attention to their analytics. I never knew HTML5 was on a leash but then again some parents actually use a real leash on their kids . HTML5 Unleashed is organized as an accessible guide of tutorials and practical references with full-color syntax and figures. The author, Simon Sarris was the top answerer for both Canvas and HTML5 on Stack Overflow so you know he can explain HTML5 in a way that you can understand. This is the only HTML5 book on the list written by a female author. Estelle Weyl will show you how to use audio, video, and graphics within the bandwidth and screen constraints of mobile devices. This is the second edition of HTML5: The Missing Manual. So much has changed since the books’ first release in 2011. Get updated information on how to draw with Canvas. Create shapes, pictures, text, and animation and then make them interactive. The book also shows you how to create location-aware apps. You will be able to write geolocation applications directly in the browser. Purchase of the HTML5 in Action paperback edition comes with an offer to get a free PDF, ePub, and Kindle eBook from the publisher. All of the HTML5 code from the book will also be available. This HTML5 book shows you how to create your own music directly from the browser. This is a good thing for people who are musically inclined and a very very bad thing for friends of people who think they are musically inclined. The book will also show you how to use motion detection and gesture control. This is another second edition that covers more new features, including CSS animations, IndexedDB, and client-side validations. “Falling Back” sections show you how to create solutions for older browsers, and “The Future” sections at the end of each chapter will get you excited about the possibilities when features mature. You will also learn how to use web sockets, geolocation, cross-document messaging, and the History API.